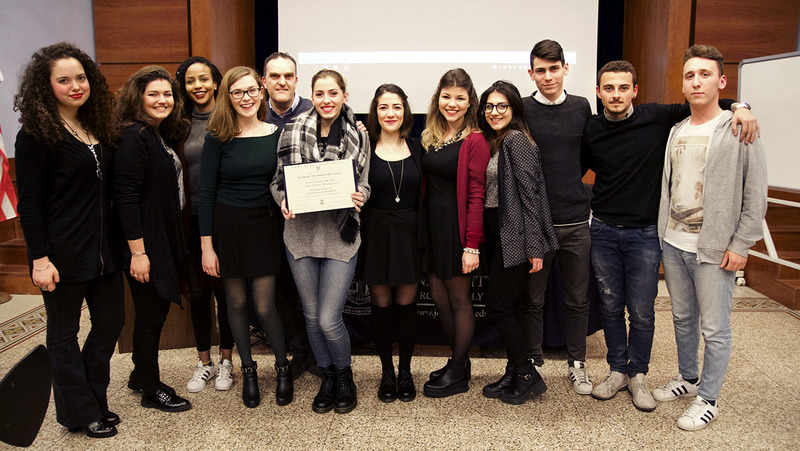 On February 23, 2017, Italy Reads Executive Coordinator Gina Marie Spinelli and Dean of Academic Affairs Mary Merva welcomed high school students and teachers to the Italy Reads Student Video Contest Award Ceremony. Italy Reads is John Cabot’s community-based reading and cultural exchange program and it is currently in its 8th year with up to 65 high schools involved. This year the program focused on Tennessee Williams’ The Glass Menagerie. High school teachers and students studied the play, supported by the JCU Italy Reads volunteers. Judges Professor Brian Thompson, Professor Gabrielle Ford, and JCU alumnus Alessandro Ceschi presented awards to the classes that produced the best 3-minute videos inspired by The Glass Menagerie. Judges selected the winners from 37 video entries produced by 381 high school students, guided by 23 teachers from 15 Italian and international high schools in Rome, Naples, Milan, and Padula (near Salerno). 1st prize (€ 500): The Glass Menagerie, by Professor Andrea Ridolfi’s students in Class 5H, Liceo Scientifico Giovanni Keplero of Rome, awarded for originality of filmmaking technique. 2nd prize (€ 300): Chained, by the students of Professor Silvana Calvanese and Professor Angela Pastore in 5B and 5C, Liceo Scientifico Carlo Pisacane of Padula, awarded for the original adaptation of the play. 3rd prize (€ 100): Second Chance, by Professor Grazia Maria Bertini’s students in Class 5M, Liceo Ginnasio Statale Virgilio, awarded for the original interpretation of one of the key themes of the play.